Suitable for use in rapid-response arenas, this how-to guide helps clinicians identify a range of ECG abnormalities, refine the differential diagnosis, and choose the best intervention. It includes chapters that address simple concepts needed to evaluate normal 12-lead ECGs, and present specialized criteria needed to interpret abnormal ECGs. Features 150 12-lead ECGs and rhythm strips, along with clinical questions. Part of the "YQA" series, this book, written in a Q and A format, provides information useful for a primary care doctor to be able to understand and treat patients who have hypertension. The answers are presented in an accessible style, with emphasis on evidence-based knowledge. Provides the reader with information to assist with treatment decisions in the field. This title covers the diagnosis, treatment, management and prevention. It also contains drug listings, clinical trial information, the developments, FAQs and website listings of the disease area. This highly practical manual promotes an evidence-based paradigm of fetal heart rate monitoring during labour. This book incorporates considerable advances in the treatment of stroke that have occurred since the first edition published. This provides an up-to-date and easily accessible source of information on all aspects of stroke care, from acute care through to rehabilitation and secondary prevention. Provides a practical guide on the care of neurovascular patients Based on nursing theory and evidence-based nursing interventions Includes detail on the management of acute symptoms, diagnosis, treatment and rehabilitation . Suitable for stroke survivors and carers who may be interested in physical activity after stroke, this book aims to provide health and exercise professionals, and other suitably qualified individuals, with the necessary information to design and evaluate exercise and fitness programmes for stroke survivors that are safe and effective. About 700,000 people suffer a stroke every year in the U.S. This plain-English guide addresses the many questions and concerns people have about strokes-from what a stroke feels like as it is happening to what steps should be taken immediately afterwards to the treatments and therapies that are necessary throughout long-term recovery. Acute Stroke Nursing provides an evidence-based, practical text facilitating the provision of optimal stroke care during the primary prevention, acute and continuing care phases. It explores the causes, symptoms and effects of stroke and provides guidance on issues such as nutrition, continence, positioning, mobility and carer support. Helps you to learn 3-lead ECG interpretation. This title helps you to understand the entire ECG process - from finding a heartbeat, to monitoring an electrocardiogram, to interpreting the heart rhythm. This is a book for any care provider - from advanced students and nurses to residents and even specialists - who needs to master the interpretation of ECGs, especially while "on the spot" at the point of care. Fully revised, new edition providing latest advances in ECG. 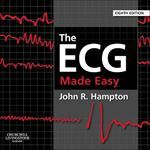 Includes three new chapters and a CD ROM demonstrating how to record an ECG. Previous edition published in 2012. Provides a clinically relevant resource on electrocardiography for those who care for patients in the emergency setting. This book provides information on ECG abnormalities and their aetiologic differential diagnoses, diagnostic criteria for the ECG manifestations of various clinical diseases/entities, and many 12-lead ECG examples for review. Hypertension remains the major treatable risk factor for premature cardiovascular disease, stroke, heart attack and heart failure. Since the last edition, several important clinical trials have been published and new guidelines on how to manage high blood pressure have also been produced. Unchecked, high blood pressure markedly increases the risk of stroke, heart attack and kidney disease. The author shows that high blood pressure can be prevented and controlled without the use of drugs. He provides guidance for combating the problem, including both general information and recipes, which offer genuine health improvement. Coronary heart disease is the major cause of death in all industrialized countries. This work is reference for health professionals who care for cardiac patients. It not only encompasses modern cardiology practice, but also considers how the patient came to arrive on coronary care, and what will happen them after they leave. Includes major sections such as Anatomy and Physiology, Instrumentation, Nerve Conduction Studies, Electromyography, Specific Diseases, and Interpretation of Results. Suitable for trainee clinicians of various disciplines who find themselves involved in the management of patients undergoing cardiac surgery, this book is also useful for those who are involved in such care in the operating theatre, and elsewhere along the cardiac surgical pathway as an insight to both preoperative and postoperative needs. Presents clinical problems in the shape of simple case histories together with the relevant ECG. This title includes detailed answers that concentrate on the clinical interpretation of the results and give advice on what to do. With wipeable page surface that allows nurses to write notes and remove them, this title covers basic electrocardiography including cardiac conduction, lead placement, and heart rate calculation; rhythm strip interpretation; causes, signs and symptoms, interventions, and treatment for arrhythmias; and, antiarrhythmic drugs, pacemakers, and ICDs. Part of the popular "Incredibly Easy! Series[registered]", this title offers what you need to know to perform competent and safe maternal and neonatal nursing care. It covers fundamentals, such as fetal development, legal issues, and ethical issues; and family planning, including advantages and disadvantages to contraception methods. "This book provides a review for ECG Interpretation for nursing students"--Provided by publisher. Encourages the reader to accept that the ECG is easy to understand and that its use is just a natural extension of taking the patient's history and performing a physical examination. This title directs users of the electrocardiogram to straightforward and accurate identification of normal and abnormal ECG patterns.